Scooper - Technology News: Innovation is transforming Latin America. Can the region reap the rewards? Innovation is transforming Latin America. Can the region reap the rewards? Disruptive innovation is unequivocally a catalyst for inclusive growth . By making a product or service more accessible, disruptive innovation transforms markets and allows for a more equitable allocation of resources. While frequently displacing established competitors, this force has the power to alter our definition of industry participants, often integrating the informal economy, resulting in powerful social and economic changes. 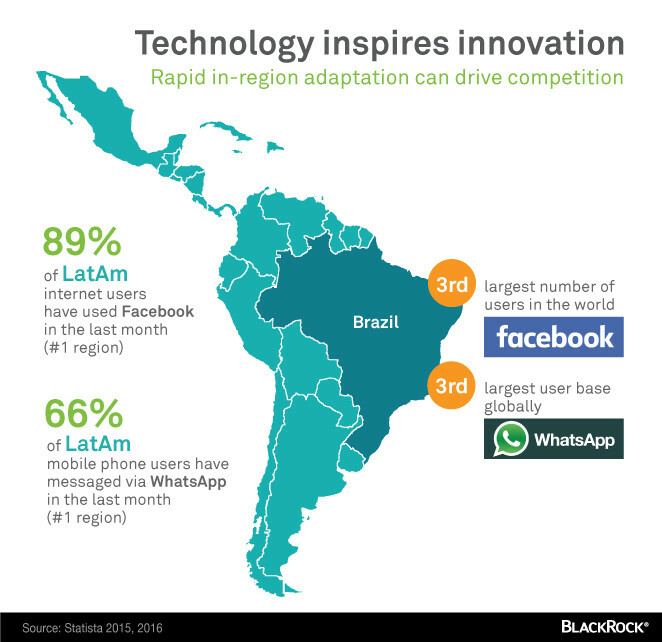 Latin America is about to experience that market disruption. Consider the region’s young population, expanding middle class, fast adoption of technology and relatively weak market competition - conditions are ripe for change. If Latin America takes steps to encourage innovation, the region’s economies are likely to be the drivers rather than recipients of that disruption. Inclusive growth - and ultimately stronger economies - could be on the horizon. The Colombian cyclist Nairo Quintana is a podium finisher at the world’s most famous bike races, including the Tour de France and Giro d’Italia. But growing up in the Andes, he had to ride almost 20 miles round-trip on a second-hand bike to a school that was 3,000 feet below in elevation simply because his family could not afford to pay his bus fare. Today, many Latin Americans still live in rural areas, but technology has enabled higher levels of societal inclusion. The internet continues to lower information barriers, and rapid technology adoption is connecting remote villages and leaving fewer people out of reach. Case in point: as of 2015, smartphone user penetration for the region was at 39% and projected to reach 57% by 2019, according to eMarketer . Drilling down further, Latin America has both the highest penetration rate for Facebook (89% of internet users) and WhatsApp (66% of mobile phone users), as Statista data shows. It’s nice that you can like your friend’s vacation pictures on Facebook or message your dad about Quintana’s stage win, but what’s next? More financial inclusion. 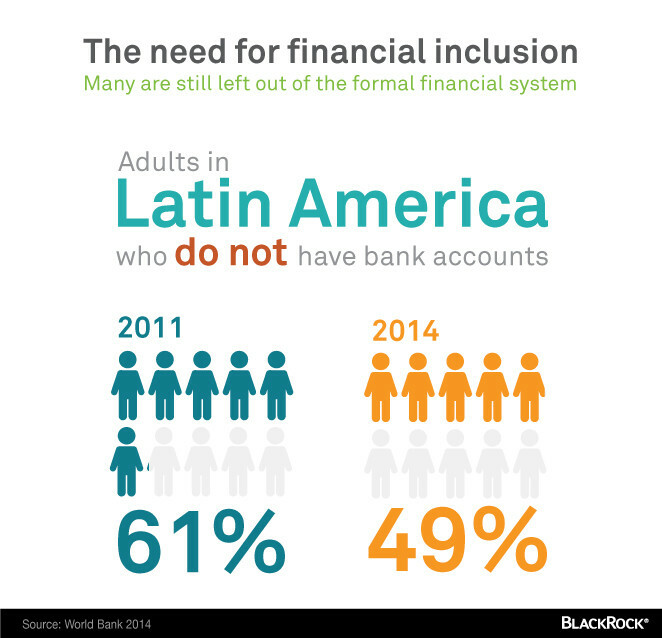 From the World Bank's data, as of the end of 2014, about 50% of adults in Latin America didn’t have a bank account. While that is down from 61% in 2011, the fact remains that standard financial services are still inaccessible to too many people. Geography, transaction costs and perhaps most crucially, a lack of financial education, make banking and investing difficult, but several local tech companies have started tackling this problem. One such effort is to build out the infrastructure for mobile transactions, thereby providing anyone with a mobile device access to banking services, no matter the location. More competitive and productive. To different degrees, Latin American countries try to promote the growth of startups and small and medium-sized enterprises (SMEs), but more can be done to improve competitiveness and productivity. In a World Economic Forum competitiveness ranking , the five largest Latin American countries by gross domestic product - Brazil, Mexico, Argentina, Colombia, Peru - ranked between 57th and 106th, out of the 140 economies measured. As a region, only sub-Saharan Africa scored lower. Why? For one, administrative burdens for businesses in the region remain high; think red tape, bureaucracy, paperwork. According to the World Bank , it still takes 83 days to start a business in Latin America’s largest economy, Brazil, compared to 29 in India and six in Italy, the countries that rank just in front of Brazil in nominal GDP. Likewise, regional bankcruptcy laws can be debilitating. Penalizing failure in this way inhibits entrepreneurs, a primary source of innovation. What has been making international headlines in the past few years? Slow growth, the commodities crash, and corruption, but these only tell part of the Latin American story. The region’s industries have taken numerous steps to foster meaningful inclusive growth but impediments remain. It is time to take control; Latin American economies have the option to encourage and embrace disruption from within, or risk being at the mercy of global forces. Have you read? How can innovation in Latin America save millions of lives? Youth unemployment in Latin America. How can we solve it? How can Latin America kickstart economic growth?